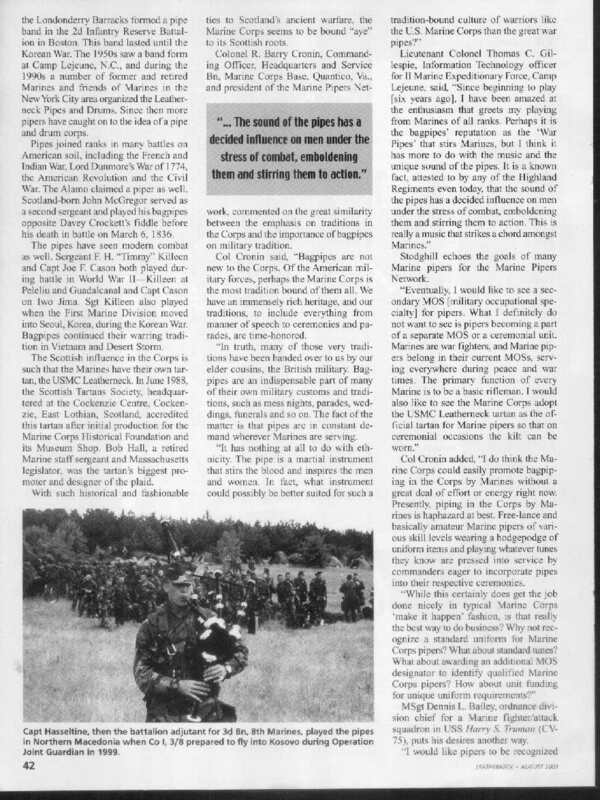 This is an interesting article that was published in the Leatherneck magazine about efforts to get piping formally recognised by the U.S. Marines. FALLUJAH, Iraq (AP) -- Amid the clatter of gunfire and explosions that regularly rock this city, an unexpected sound rises over the front line - bagpipes. Dressed in Marine fatigues with his gun at his side, 1st Sgt. Dwayne Farr, 36, blows into his set of pipes. The plaintive wail is carried by the wind that whips across this dust-blown, war-torn town. "Playing on the battlefield - I never thought that would happen," Farr said. Farr, an African-American from Detroit, was inspired to learn when he saw another player who didn't match the Scotsman stereotype. 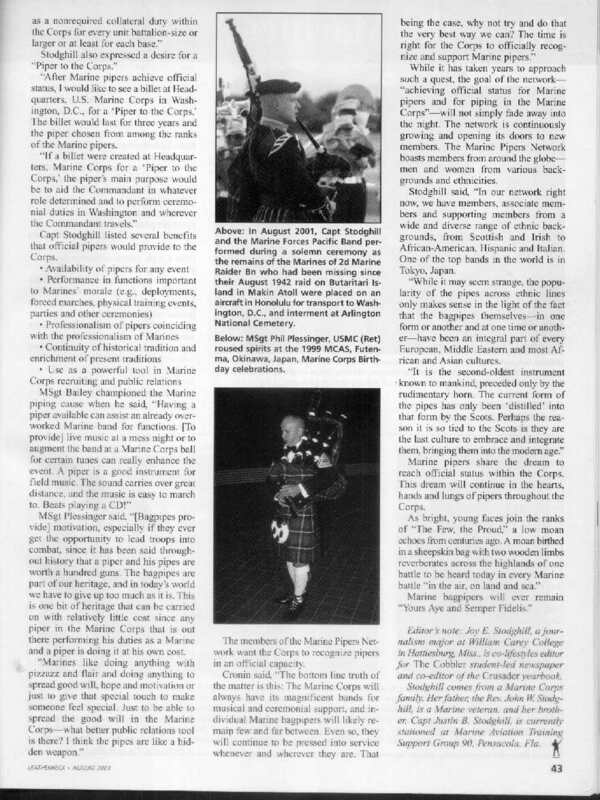 "I was at a funeral and I saw a Marine playing the bagpipes, and I thought, this isn't a big, burly, redheaded guy with a ponytail and a big stomach. He's a small Hispanic Marine. I said if he can learn to play the bagpipes, I can learn," he said, chuckling. But Farr is unfazed. He's looking for a desert camouflage kilt he can wear in operations like these. 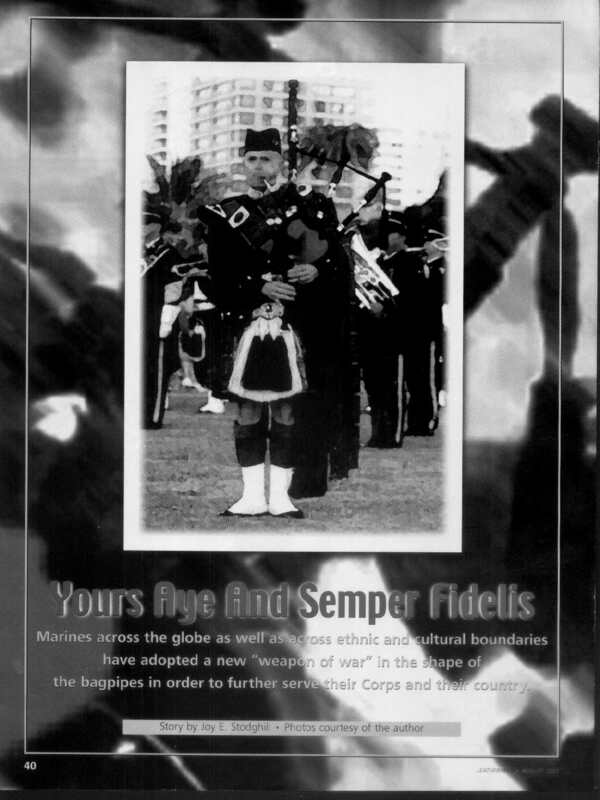 "Kilts are something that fighting men wore many years ago, and we know that the Marines are fighting men. So real men wear kilts. And they are pretty comfortable too," he said. Among his admittedly limited repertoire is "taps," the tune traditionally played by the military when a service member is killed. Farr has played it several times over the past days in Fallujah. 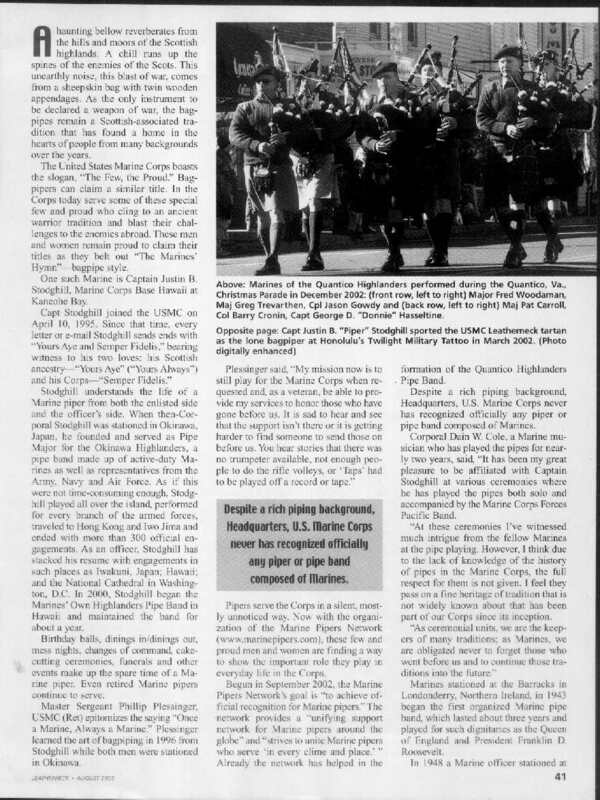 Marines say the sound of the bagpipes is a morale booster. "It's something to hear besides the rockets and gunfire," said Master Sgt. Rowland Salinas, 42, from San Antonio, Texas. "It's something that soothes the mind."